“How to teach your baby to be Physically Superb” is a book that has truly changed the way I interact with my children and how I view their physical development. Now it is a big part of our homeschooling program. I think some of the things he recommends doing in the book are somewhat impractical, like recording how far your child crawls or walks each day to measure improvement. I just did not want to deal with that, but applying the principles have really helped my children. There are a lot of things you can do with your child around the home with things you already have. This book is very different from Doman's other books. It's fully illustrated too. Some of the things I learned from it are things like dressing your baby for success as they are learning to crawl and walk. 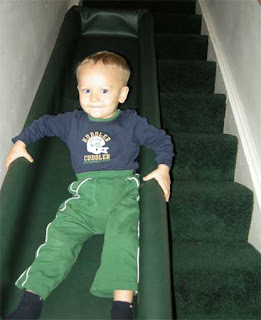 For example, having a child wear pants while they're crawling on the carpet is important so that they can be comfortable, and the rough surface of the carpet won't discourage them to try. For walkers, a hard surface without socks or shoes is ideal because it is easier to balance. I spent a lot of time with Peter in the kitchen when he was learning to walk, and it really did make a difference. I also did not hold his hands when he was learning because the book says that the act of holding your arm above your head throws your body off-balance. That made sense to me. When I was helping him learn to walk, I only offered him back up support, catching him if he lost his balance, keeping my support at his waist level. He was walking solidly at 10 months, and I know it was because of the help this book gave me. His book also talks about the importance of mobility for brain development, not just physical development, as children learn about spatial recognition, and can explore their world. (Baby-wearing is also great for brain development for the same reason.) So don't lock your kid up in a car seat all day. Really the only expensive equipment he recommended was the monkey bars and the crawling track, but there are directions for making them at the end of the book if you choose to do so. 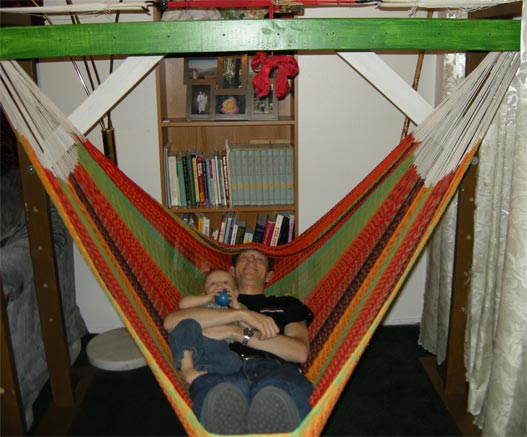 Most of it is practical things you can do around the home. Brachiation ladders are essentially monkey bars. Brachiation ladders help children develop their lungs and upper arm strength. Babies naturally have a lot of upper arm strength, but they lose it if they don't use it, and this is a way to encourage them to maintain it. A lot of the reflexes that babies have are similar to other primates, and other primates need that strength to hold on to their mother at birth, and then for transportation. Here the book appeals to our evolutionary development, and I believe in the Creation theory, but I can take it with a grain of salt. The truth is, we have those reflexes, and the brachiation ladder can help children take advantage of those reflexes. We made a brachiation ladder and Peter LOVES it. We didn't quite make it to Doman's specifications. See detailed instructions to build a brachiation ladder here. Ours is 5 feet tall and 6 feet wide, and was made mostly by 2x4s instead of 2x6s (except for the base). The bars were made from 3/4" oak dowels spread 6 inches apart, and the ladder is 18" wide, which is the size Doman recommends for ages 18-36 months. It comes apart in 3 pieces and is easy to transport and store, there's two bases and the ladder. The ladder height is adjustable, we have ours set up so Peter stands on his tip-toes and can reach the bars, so he can independently swing on them. It took my husband and a neighbor about 8 hours to make two, plus the time I spend sanding and painting the ladder, which was also a time consuming thing. The cost was about $45 per ladder, plus the paint which we already had. This price was much less then the estimates I've seen other places to make one. We filmed a lot of the process and are going to make a video, which of course I'll share when we actually do it. Right now Peter is more in the pre-brachiation stage. He likes to move his hands around on the bars, but mostly we let him hang for a few seconds, and he just squeals with delight when we do. We count to three before we let go, and he always laughs in preparation. Of all of the Doman things we've done, this is his favorite, and he requests it several times a day. It was a lot of work to make it, but now we have a very beautiful and useful thing for our children to use, and we're in the beginning stages of parenthood, so we plan on using it for a long time. We keep our ladder in the nursery. We're co-sleeping, so no bed in the nursery makes a little bit more room. We also store some of Peter's larger toys under the ladder and move them when we brachiate. I know some people put the ladders over the children's bed and that seems to work for them. But we're blessed to have a nursery where it fits, and I don't know if I would want one in our living room. My parents have an outdoor play gym with monkey bars on it, and my little siblings use it A LOT, so an outdoor set is of great benefit too. I know we use our set a lot more because it is inside, especially in the winter. One safety concern we now have is that our neighbor's older child climbed on top of their ladder and fell through, and the bars were too close for his head to fit. Fortunately it was close enough to the ground for him to stand up and he was alright, but it's a bit scary in that respect. Here is another use for the brachiation ladder. ...and another use for the crawling track. Weee!